The deadlift is an exercise that works many large muscle groups including the quadriceps, hamstrings, glutes, core, and entire back. It’s often used to measure overall strength or maximum strength. This is a major lift that should be included in most workout regiments. It can be utilized by athletes who need to build strength and explosiveness. Anyone who is trying to loose weight, or build muscle would also benefit from this lift because of the large number of muscles involved. 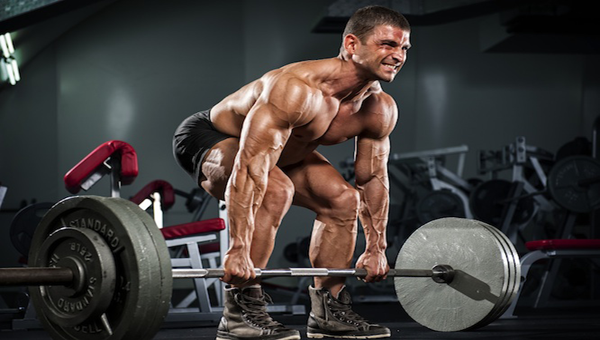 To do a deadlift you can use a barbell, dumbbells, or bands. Most of the time it’s done with barbells. In the starting position you should have your feet shoulder width apart with your hips sitting back and your chest out. Your hands should be placed evenly on the bar with your arms just outside your knees. As you pull the weight up, straighten your legs and drive your hips forward in unison. The bar should come straight up your shins and thighs (it doesn’t necessarily have to be touching your body, but it should be close). Your abs should be tight in order to maintain a good posture. The weight should be shifted into your heels to make sure your legs are taking some of the work off of your back. A common mistake people make during this lift is straightening the legs before pulling up on the weight. That places all the work on the back. Doing this makes the lift less efficient and you most likely won’t be able to lift as much weight.